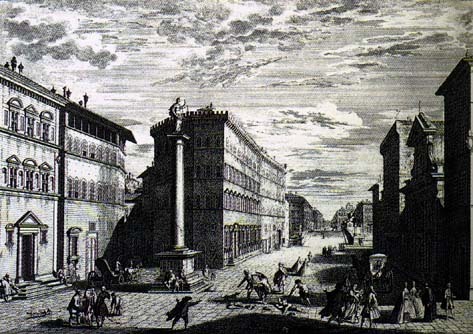 The Mugnone now falls into the Arno much lower than it formerly did, reaching the greater stream only at the western end of the Cascine: a change which may be reckoned with the rest as one of the causes why commerce no longer comes to Florence by water. Pass this confluence, however; pass the shallow of Marcignana, which the alkuium brought down the Mugnone has formed, and the river begins at once to show what it can do still, in the manner, if not the measure, of the greater past. At Ugnano, scarcely a mile below the Cascine, a true cargo-boat, though of small size, lay waiting its load in the winter of 1909; I suppose this is now the highest point reached by the existing river trade. Such boats, however, you will find in growing number as you follow the growing river; at Signa, where it has already received the Bisenzio; at the Golfolina, where the Ombrone falls in, and, definitely, at Montelupo, where the Pesa joins the Arno, and where manufactures of earthenware and glass are set on the stream and use it as a means of transport. Empoli sees the confluence of Arno and Elsa, and its match factories bring custom to the growing trade. It is not difficult to understand that, if the river is to compete with its rival the rail, its advantage will lie here; in the transport of fragile things like pottery and glass, or combustibles like sulphur and lucifers, on which the railway levies high charges for so dangerous a freight. Another advantage appears at Calcinaia, between Pontedera and Pisa, in the canal which runs directly from this point in the river toLeghorn, offering a shorter route thither than the rail can show. 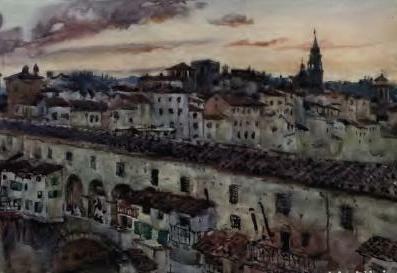 Calcinaia is therefore a prosperous place, and here, or at the neighbouring Fornacette, you may see for the first time the really heavy boats of the lower Arno; built to carry bricks or grain to Leghorn, and to return with loads of coal for the kiln, or sulphate of copper for the vineyards. This canal is called the Fosso del Arnaccio, as if the river itself once followed the very route the canal keeps to-day. Strabo, in fact, speaks of the Arno as ‘threefold’ ; hinting at a considerable delta towards the mouth, and thus it may well be that the present traffic by water is not merely a survival of the past, but that, in a singular persistence, it still keeps the ancient line of passage, a branch of the river once followed across the Pisan plain. Not that the same boats may not be found at Pisa too, lying in the Medicean port with its great sluice and roof, or crowding the canal of the Naviglio for which that port was built in 1603. They are of precisely the type we have already studied atFlorence, with a rather exaggerated sheer fore and aft, which, in the stern, leaves room for a great earthen water-jar under the curve of the tiller. The chief difference is in the size of the boat, for these of the lower Arno may run to twenty-five or even thirty tons as against two or three at Florence. It is time to pass from the boat itself to the use that is made of it, which, at Florence, is mostly the gathering and carrying of the river sand. The boatman is generally, if not always, a renaiuolo, or sand collector; one who lives by finding and bringing to bank what the river in flood has laid down. This debris of the hills is what first filled the plain that had been a lake, and so furnished – whether the vehicle was Arno or Mugnone – the foundation on which Florence rose. The river is flowing still, and still bringing down its deposits, and the sand of the Arno is sought to-day as of old by those who have building to do on this site. Once, the coarser gravels were prized as material for that wonderful calcistruzzo the concrete, hard as rock itself, which formed the heart and substance of every Florentine wall, of palace or of tower. Beside all its other advantages the site of the city had this convenience that here the very digging of foundations produced most of the material required for the building that was to occupy them. The pietra forte of the hills, the macigno of Fiesole, were indeed quarried and carried hither, but only to serve in small pieces as the wall facing, within and without. Between, the hollow heart of the wall was filled with river gravel, and among these stones was poured the fluid mortar that the finer river sands helped to compose and to bind. When the wall, thus built and filled, had settled and set, it was as nearly indestructible as building could be, and owed its strength not to what the quarry yielded, but rather to the skilful use of what the river had brought, the gravel or sand that in cunning proportion formed the wall-core. This manner of building is practised no longer, but still, though the gravel is seldom sought, the sand is in constant request, for Florence grows in every direction, and without sand to make mortar, building, even as practised to-day, cannot go on. In the neighbourhood of the city there is no ground where lake water has not lain and left its deposits; hardly anywhere the Arno, Affrico, and Mugnone, in their floods, wanderings, and constant changes, have not again and again passed to lay gravel and sand in alternate beds upon the blue clay that once formed the lake floor. Digging will find sand everywhere, as you may see in the fields beyond the Madonnone towards Varlungo, where the sand-pits call the builders’ carts, and the whole structure of this alluvium is laid bare down to the clay itself. But plainly these beds are the work of the river in its wanderings, and it is to the river men still turn when they want sand of the finest, and would have it without breaking arable land or bending to the labour of the spade. Not every sand-gatherer can afford the money that would make him the owner of a boat; hence the renaiuoli are divided into two classes, the barcaiuoli, or boatmen, and the piaggiaiuoli who keep to the bank. Every flood brings these men their fresh opportunity, for, as the Arno rises and changes colour, it brings down anew the debris of the hills, the gravel and sand; at first suspended and transported, then sinking as the water turns green again; at last settled in some new arrangement of deposits on the river bed. When the flood has passed it is the piaggiaiuolo who opens the work of dealing with what it has brought down, for the banks he labours are the first ground to stand clear of the falling waters. His tools are the spade and the screen. He sets his screen among the mingled sand and gravel of the shore and flings against it what he digs up. The gravel falls back from the screen, the sand passes, and forms a heap behind, ready for carriage to some larger deposit of recovered material which the wheelbarrow reaches along a path of planks. Meanwhile the screen and heap mark the centre of operations, round which, within the shifting radius that the plank path describes, the piaggiaiuolo tries for sand in every likely spot. It is hard work and hot, as the sun beats white on the gravel banks, and the men are apt to throw off all clothing but a ragged shirt and sash, showing limbs bronzed and muscular as those of any ancient statue. You may see them thus at work any fine day after flood, below the river wall of the Lung’ Arno Vespucci, as if time had made no progress, and life at Florence were still what it once was, savage and primitive. The barcaiuoli, on the other hand, are the aristocrats among these river workers; owning craft of their own, and using their boats to seek under water the last and finest sands that the falling flood deposits: you will find them busy as soon as the river gives sign in its change of colour that what it held suspended has fallen to the bottom. They know the Arno from boyhood, and punt their light craft with skill till the boat lies right over the new sandbank on which they mean to work. The pole, rather than the oar, is what they use in this progress, for so they are in constant and sensitive contact with the river bed; not only moving up and down, but trying the ground as they go. They stop when the pole tells them; where the river has just laid what they are seeking. Then the pole is exchanged for the pala, and the work of getting the sand on board begins. The pala differs from the punting pole only in having an iron scoop fixed at one end. Standing on the predellino, one foot braced firmly on the fattorino, the boatman lets go his pala till the scoop touches bottom and enters the sand-bed. Slowly, laboriously, with tact to skim the finest layers and strength and supple skill of wrist at the upward heave and rising turn and discharge, the sand is secured, a scoopful at a time, and heaped on the palco amidships till the boat sinks to the very water-line and limit of its capacity. The sand that comes up wet and shining in the scoop dulls in a flash as the water drains out of it. Alike on board and on shore the heaps grow slowly, like mounds of grey sugar, as load after load is completed and brought to bank; these are the boatman’s riches, the gains of his skill, strength, and patience. Work with the pala would be even harder than it is were it not that the boatman has the art to use the pole of his tool as a lever, finding a fulcrum for it on the gunwale of the boat, and throwing all his weight inwards on the upper end of the pole. This trick has brought about the addition of four pieces to the barca – the regoli – notched to take the pole of the pala, and fixed to the gunwale fore and aft, two on each side, to strengthen the boat at these chief points of wear and strain. The regoli, as mere additions, can be easily replaced as soon as they are worn out. In the disposing of the sand he has won from the river, neither barcaiuolo nor piaggiaiuolo deals directly with the builder who requires it. They are not his servants, nor any one else’s, but masterworkmen free to dispose of their gains as best they may. In this liberty the renaiuoli turn to another class and trade, that of the barocciai, the carters who act as middlemen in the business. The renaiuolo sells to the barcaiuoli, and he again to the builder at an advance which pays for the carriage. 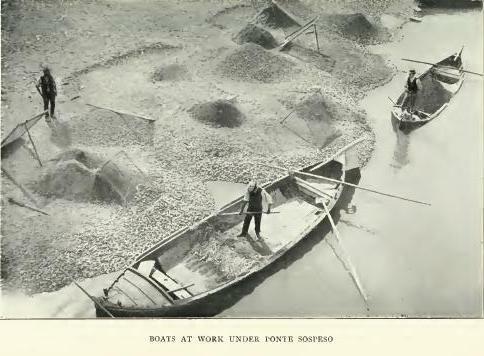 At present, sand is bought and sold at a price which may be as much as six lire per cart load, at a time of great demand; the price tending to rise with the late activity of the building trade at Florence. If you ask the renaiuolo, he will allow that his working day is worth anything between seven and ten lire. It must be remembered, however, that the river is not always in order, and the average gains in this trade may therefore be taken at four lire per day, or, say, £50 a year. Florence holds and employs about one hundred and twenty renaiuoli, of whom eighty or so may be barcaiuoli and forty piaggiaiuoli. This means that sand is taken from the Arno to the yearly value of some £6000; no contemptible gain, when the state of the stream and the general conditions of life in Florence are considered. Neither of us are in love with Italy, and therefore I devoutly hope that we may be back in dear England by the end of December. The travelling here may be divided into three classes plague, pestilence and famine. Plague the mosquitoes. Pestilence the smells, and Famine the dinners. Nevertheless Pups, who is never satisfied with anything at home, seems to thrive upon the abominations here, as he grows quite fat, or as Byrne says: ‘Mr. Bulwer out of contradiction seems to enjoy the bad beds and bad dinners,’ while I am getting quite thin upon lemonade and lamentations. Poets ought to be strangled for all the lies they have told of this country. ‘Mother of Paintings and Sweet Sounds’ it certainly is, but not sweet smells… The entrance into Florence is certainly beautiful, being completely crowned with vineyards, plantations of silver olives and orange, lemon and pomegranate trees; and with the Grand Duke’s Gallery, no one can be disappointed; but excepting these, Cheltenham or any other little watering place in England is twenty times a prettier town. Oh, and the flowers I forgot those. They are splendid. How I wish I could send you some of the beautiful violets, myrtle, carnations and magnolias that are now before me. Our windows look upon the Arno. How fine that sounds, and yet it is a dirty little, narrow, ugly, muddy river, covered with little ugly Feluccas in which are coarse, ugly men in more than a state of deminudity, shovelling up the mud all day long. In short, even the Westminster Bridge part of the Thames is a hundred times handsomer.